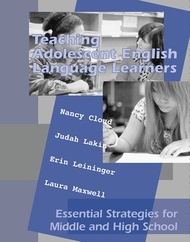 Teaching Adolescent English Language Learners: Essential Strategies for Middle and High School brings middle and high school English language learners alive. With evident respect and appreciation for these learners, the authors show teachers how to learn about their students and how to implement practical, effective instruction and program designs so the ELLs can be successful in school. The authors are bilingual and bicultural themselves and clearly demonstrate that they understand adolescents and schooling. Teaching Adolescent English Language Learners provides practical advice and field-tested strategies and techniques for the classroom. The authors have also drawn from the research literature on the transfer of skills from the first language to a second and competently explain how use of native language resources and respect for bilingualism can enhance student learning in Chapter 3. A plethora of instructional suggestions are included in Chapters 5-8 that apply to multiple subjects and types of learners, many with examples of student work, and all with steps for implementation. These ideas have been utilized in real-life classrooms so teachers can be assured that they work. The text goes beyond instructional techniques and lesson planning to a whole school approach with guidance for program design, professional development, and support services. It embodies the philosophy that every student can learn and, as the authors express it, "make it to graduation."